How have you made a difference in the life of a child lately? If you don’t have the opportunity to see kids all the time, or figure you want to enhance the lives of even more kids, consider Big Brothers Big Sisters of the Greater Twin Cities, the mentoring organization that matches adults with kids in the area who need a buddy. 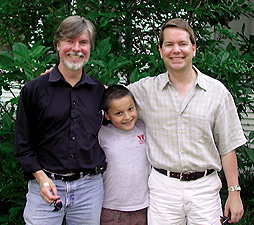 Oh, did I mention that it not only is GLBT-tolerant, but also welcomes GLBT mentors with open arms. Kimberlee Sinclair, Vice President of Marketing and Public Relations, helped shed some light on the agency. Why did Big Brothers Big Sisters become a sponsor of Twin Cities Pride this past year? Big Brothers Big Sisters of the Greater Twin Cities provides mentors to young people in the 11 counties surrounding the Twin Cities, and we serve people from a wide range of demographic backgrounds, including those from the GLBTQ community. Pride provides us a great community venue at which to reach potential volunteers and children who may benefit from spending time with a caring adult. What are some of the benefits of becoming a Big Brother or a Big Sister? Being a Big Brother or Big Sister is one of the most rewarding volunteer opportunities an adult can have. In addition to making a big difference in the life of a young person, our volunteers often report back to us how much the experience has changed them, and opened up their worldview. When our Bigs and Littles get together, they can do anything they both enjoy—from bike riding to visiting a museum or community event to playing video games, or just going for a walk and talking. What are things that you look for as red flags for people becoming Big Brothers or Big Sisters? Our agency conducts in-depth interviews with our volunteers and families, and we do criminal and driving-record background checks on all volunteers. Child safety is our number-one priority. Gays and lesbians being involved in organizations that deal with kids has been an issue with other groups, like the Boy Scouts of America. What do you think has prompted Big Brothers Big Sisters to take a stand, and not jump aboard that bandwagon? At Big Brothers Big Sisters, we believe that all people—no matter what their backgrounds or beliefs—can benefit from participating in a mentoring relationship. We do honor families’ and volunteers’ personal preferences related to whom the child and adult are matched with. Beyond that, we are supportive of everyone who wishes to create strong one-to-one mentoring friendships. What kinds of commitments are you expecting of adults who enroll to become Big Brothers or Big Sisters? We require that matches [Big Brothers/Sisters and their Little Brothers/Sisters] spend time together two to four times per month, with a minimum commitment of one year. Is there any particular demographic of mentors the Big Brothers and Big Sisters programs are looking for? It is our belief that every young person can benefit from a mentoring relationship. Therefore, we are open to all demographics. How are adults paired up with kids? During the interview process, we ask many, many questions about what each volunteer’s and child’s interests are. We find out what they would want to gain from the friendship, and then, we match young people with volunteers with whom they share interests, and can build a strong friendship. What have you heard from the adults helping your program as the most rewarding part of being involved in Big Brothers Big Sisters? Remembering what it’s like to be a kid, and being able to help that young person grow into a competent, confident, and caring adult. What other ways besides mentoring can people get involved in Big Brothers Big Sisters? We rely on charitable gifts to operate our programs. Even a small donation, whatever the size, enables us to continue serving young people. We also have a group of Everyday Advocates who volunteer their time to help us recruit and engage more Big Brothers and Sisters. Our Everyday Advocate team staffs community fairs, such as Pride, and they promote our work to their personal and professional networks. What, in your opinion, is the best reason people should be involved in Big Brothers Big Sisters? Becoming a mentor is easy, and the benefits—to both child and adult—are profound. This is a way to give back to our community in a way that will leave a lasting legacy. For more information, or to become involved with Big Brothers Big Sisters of the Greater Twin Cities, go to www.bigstwincities.org.